We have spent a great week back with my family. The girls have loved seeing their cousins. Seeing them have fun together makes we wish the distance between us was shorter. I was so fortunate to have my extended family in town. I adored seeing my cousins. Family gatherings were something to look forward to because it was the times when we could play in large groups. I miss those days. I long for them for my girls. This picture is a favorite. 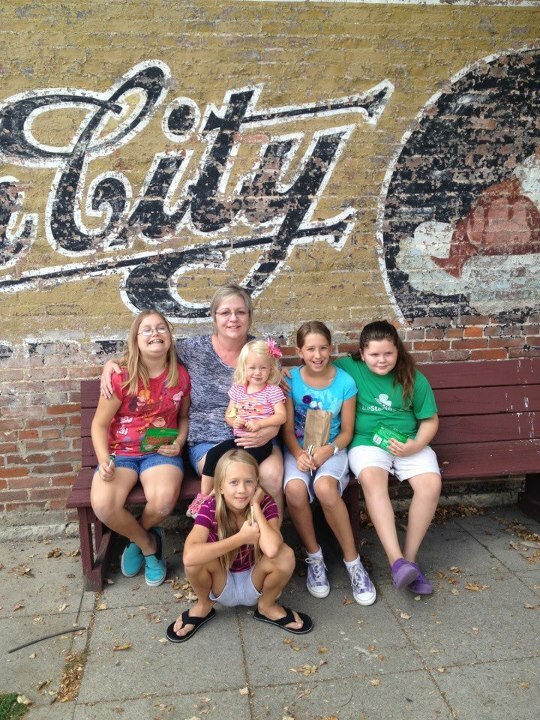 My mother surrounded by her 5 granddaughters. It is wonderful. Remembering how happy all those girls were spending time together is evident in this picture. I pretty sure the girls were planning another activity as I snapped this picture. Childhood should be just that; on to the next fun adventure. Spending a week in my hometown was both fun and busy. I had forgotten how much there is to do. So much we have not even been able to do. I love that! It means we will always have something else to do that is new and exciting. We're already planning our next list of activities for our return trip. The girls have already requested that we stay longer, 2 weeks at least. I like the idea. More time equals more fun.